(Bloomberg) -- Robert Mueller's final report robbed Democrats of what they hoped would be a devastating blow to President Donald Trump. And, after defending the special counsel's integrity for more than a year, they have little room to challenge his conclusion there was no conspiracy between Trump's campaign and Russia in the 2016 election. Yet, even before the special counsel's 22-month probe ended, Democrats were already working under a Plan B to undermine Trump going into the 2020 presidential race, through investigations led by House committees now under their control. 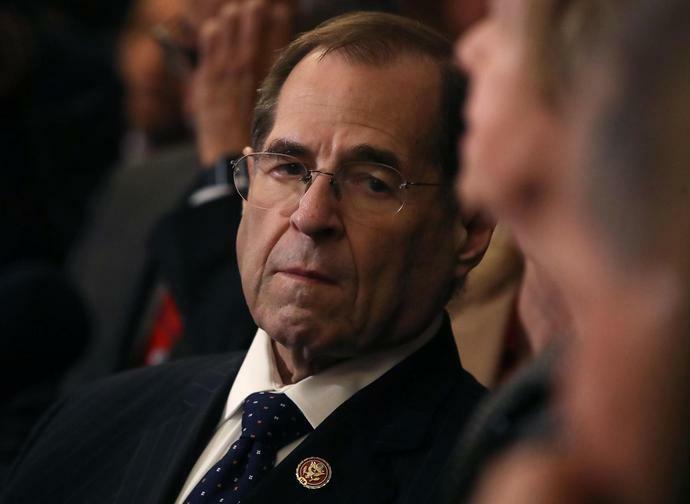 "We're going to move forward with our investigations of obstruction of justice, abuses of power, corruption, to defend the rule of law, which is our job," House Judiciary Chairman Jerrold Nadler said Sunday at a news conference in New York. "It's a broader mandate than the special prosecutor had." The strategy poses risks for the Democrats, particularly if voters prove tired of talk of investigating Trump now that Mueller has completed his work. In addition, the probes could overshadow their agenda, particularly on issues like health care that helped the party take back the House in 2018. White House spokeswoman Sarah Huckabee Sanders called the Mueller report a "two-year waste of taxpayer time and dollars" in an appearance Monday on NBC's "Today" program. "We are all very glad it's over and we can move forward and focus on things that really matter," she said. Within an hour of Attorney General William Barr delivering a summary of Mueller's report to Congress, Nadler said his panel will call the attorney general to testify about "very concerning discrepancies and decisions at the department" in its interpretation of Mueller's findings, particularly the decision not to pursue an obstruction of justice prosecution. Barr's "conclusions raise more questions than they answer given the fact that Mueller uncovered evidence that in his own words does not exonerate the president" on obstruction, Nadler said. Trump lawyer Rudy Giuliani said on Fox Monday morning that Americans should breathe a "sigh of relief" at Mueller's report. "It's quite clear that this group was hardly a group of Trump fans," Giuliani said during n appearance Monday on Fox News. "It was thorough and it was conducted by people who had a bias to get him." Another Trump lawyer, Jay Sekulow, said on MSNBC, "It's very hard to complain when you've got this letter from the Department of Justice." Investigations in the Democratic-controlled House stretch across six committees, including Nadler's Judiciary panel along with the Intelligence, Financial Services and Oversight Committees. The topics for investigation include alleged public corruption, presidential abuses of power, Trump's banking relationships, his tax returns and efforts to quash embarrassing stories about the president in coordination with the National Enquirer. One benefit for Democrats is that it may ease pressure for now from a faction of House members who've been pressing to begin impeachment proceedings. With polls showing most of the public didn't support impeaching the president even before Mueller's findings, House Speaker Nancy Pelosi had been trying to tamp down that talk. Barr's description of Mueller's report as finding no criminality makes her caution appear savvy. Republicans dismiss the House investigations as a fall-back strategy long planned in case the Russian collusion narrative collapsed, as it did, under Mueller's conclusions. They accuse Democrats of undertaking a wide-ranging congressional fishing expedition simply to wound Trump politically heading into the 2020 elections. The House Judiciary panel's top Republican, Doug Collins of Georgia, said Sunday he hopes Nadler "recognizes that what may be political fodder for Democrats may not be good for our country." Top Oversight Committee Republican Jim Jordan of Ohio added, "I hope this will put an end to the partisan and political investigations in Congress aimed at undermining President Trump." Democrats argue that oversight of the executive branch is a basic and important congressional role. "Apparently the Republican definition of oversight is harassment," responded Representative Gerry Connolly of Virginia, chair of the Oversight subcommittee on government operations. "And that's a brand new definition." Connolly pointed to multiple, sustained investigations undertaken by Republicans when they controlled the House and Senate and Democrat Barack Obama was in the White House. Those cited by Connolly include the long-running probes of the deadly 2012 attacks on a U.S. outpost in Benghazi, Libya, and scrutiny of former Secretary of State Hillary Clinton's use of a private email server, as well as investigations into whether the Internal Revenue Service targeted conservative or GOP-aligned political groups. "If you're going to be a phony, at least be sincere about it," said Connolly of Republican complaints about politically motivated Democratic congressional oversight. However, there was a political element to those investigations. Then-House Majority Leader Kevin McCarthy boasted on Fox News in 2015 that the lengthy Benghazi investigation of Clinton, who went on to be the Democrats' 2016 presidential nominee, was part of a "strategy to fight and win" by portraying her as untrustworthy. He said Clinton's poll numbers dropped as a result. Even before Barr's letter on Sunday, Democrats were underscoring that they will fight -- in court if necessary -- to get Mueller's full report, including its underlying documents. They say that material will help their probes. "It will greatly facilitate our own investigation not to have to reinvent the wheel,"said Intelligence Committee Chairman Adam Schiff, whose panel will be looking into any foreign influence over Trump. He said it would be "enormously time-consuming, and not entirely possible," to retrace all of Mueller's steps. He, like other Democrats, called for public release of the entire Mueller report. "I trust Mueller's prosecutorial judgment, but the country must see the evidence," Schiff said in a tweet. Schiff's committee and other panels also are planning to hold public hearings to scrutinize Trump's administration, and his personal business and finances, daring Trump to fight turning over documents and other material. The House Judiciary Committee, which has jurisdiction over impeachment, has already sent out 81 requests for documents from the Trump administration, his family, associates, businesses and other entities. And that's likely just the start of the demands for Trump-related materials. Nadler said the focus won't be limited to impeachable crimes and misdemeanors. Along with Intelligence and Judiciary, the Oversight and Reform, Financial Services, Foreign Affairs and Ways and Means committees also are pursuing Trump-related investigations and hearings. For Trump's allies and supporters, the continuing investigations may turn into a rallying point. "Democrats took us on a frantic, chaotic, conspiracy-laden roller coaster for two years, alleging wrongdoing where there was none," said Trump's 2020 campaign manager Brad Parscale. "Their dirty tricks have not ended. Even today Democrats have picked up the disgraceful mantle of investigating, obstructing, and destroying the will of the American people at any cost." "They failed once and they will fail again," he said. --With assistance from Erik Wasson and Terrence Dopp.